And, to further entice you, GINGER is running a special promotion for all Ladyironchef readers. Simply quote “LICX42” when making reservations and this seafood feast is yours for only S$42++ per adult (U.P. S$58++) from now until 08 Dec 2017. This offer is valid for dinner daily and lunch on weekends. One star attraction at GINGER is their ‘live’ stations where chefs whip up your dishes expertly right in front of your eyes. Visitors get to experience the impressive theatrical element first-hand and one you must not skip is the Pan-Fried River Prawn station—we were absolutely floored by the aroma of succulent prawns doused in Chinese wine. Now, let’s find out if the food at GINGER tastes just as good as it looks. The Pan-Fried River Prawn is a gorgeous dish and we are not just talking about its stunning physical appearance. A favourite among all of us at the table, the plump river prawns were juicy, sweet and had a touch of alcoholic fragrance thanks to the use of Chinese wine. To enhance the taste of the dish even more, eat the river prawns together with fresh leeks. For the uninitiated, Sha Cha sauce is an important condiment when it comes to Chinese cooking and you can mostly find this flavour in Fujian, Teochew and Taiwanese cuisines. The main ingredients you can usually find in the classic Sha Cha sauce are chilli, dried shrimps, garlic and shallots. GINGER’s Wok-Fried Crab In Sha Cha Sauce reminds us of our grandmother’s homecooked recipes during family reunions and it is ever so comforting. For many Chinese, this is the taste of nostalgia. You may have tasted braised crabs but GINGER’s interesting rendition of Braised Crabs In Aged Coconut is probably something you have not even heard of before. The crabs are lightly seared before it is stewed and this slow cooking method ensures that the coconut juices are locked in so that every bite of the moist crab meat is robust. Upon first inspection, the baked salmon looks pretty much like any standard Chinese cooking. Dig in a little deeper and you will find little surprises in this dish that makes it extraordinary. For a start, the salmon meat was runny (just the way we like it) and carried a light ginger scent while the skin was slightly crispy at the edges. What made it really good though, was the addition of homemade lemongrass pesto sauce—blended with chilli and garlic—that really elevated the taste of the well-loved pink fish. During our previous trip to GINGER, we were blown away by the sheer intensity of flavours coming from their Stewed Lobster With Ginger In Superior Stock and we are glad that the team has decided to keep this crowd-pleaser on their new menu. In all honesty, this seafood broth is one of the best we have tried so far and it is the result of boiling lobsters, prawns, mussels and clams for hours. But don’t just take our word for it, you really have to head down to the restaurant and try it for yourself. There is still so much more to expect from GINGER’s new buffet lineup. 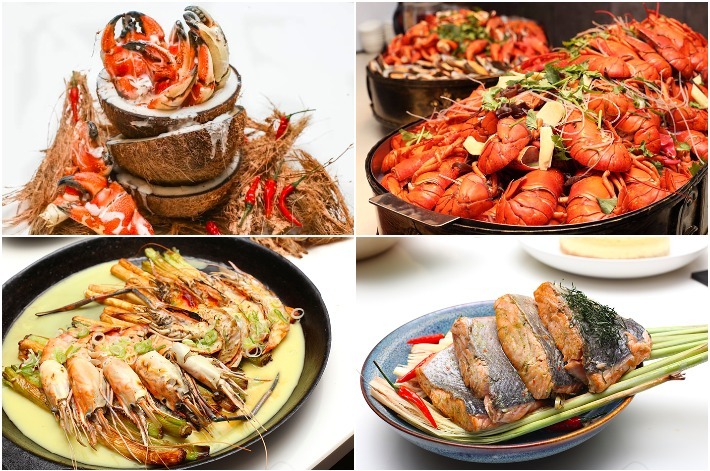 For those who love Singapore cuisine, you would be pleased to know that they have Chilli Crabs paired with Deep Fried Mantou, Salted Egg Yolk Crabs, as well as Black Pepper Crabs. Beyond that, diners can also feast on staples from the Straits Settlement including Penang Hokkien Prawn Noodles, Oyster Omelette and Penang Char Kway Teow. 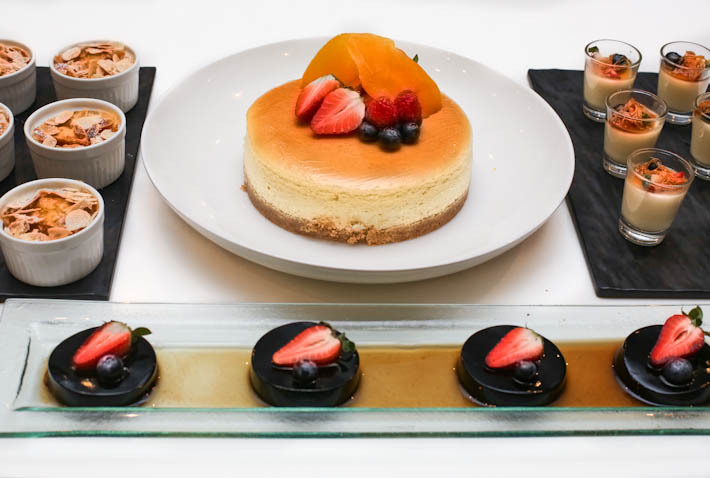 When you are ready to start on desserts, head over to the dessert counter where you can indulge in cakes, jellies, kuehs and all things sweet. On top of the classic local desserts such as Ang Ku Kueh and Kueh Dadar, some unique treats that are recently added to the dessert collection include Lemongrass Cheese Cake, Ginger Flavoured Bread And Butter Pudding and Ginger Milk Pudding. Remember to quote “LICX42” to enjoy A Clawsome Lobsters and Crabs Affair at S$42++ per pax (U.P. S$58++) from now to 08 Dec 2017. On top of that, guests will also receive a complimentary parking coupon per table per bill from now until 31 Oct 2017. **This promotion is available for dinner from Mondays to Sundays and lunch on weekends (valid on eve of and on public holiday). **Prices stated are subject to service charge and Goods & Services Tax (GST). **Offer is not valid with other promotions. Can you advise how do i quote “LICX42″?